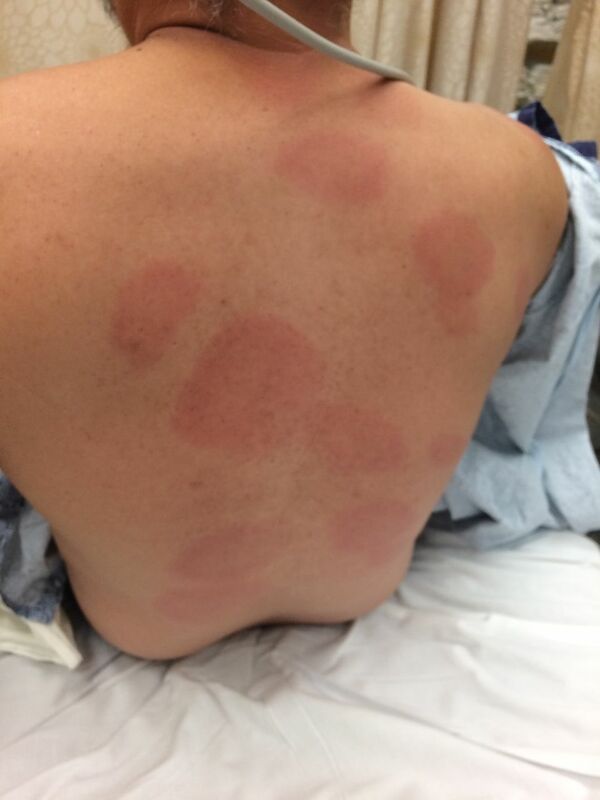 A 47-year-old man presented to the emergency department with fatigue and a rash. Two weeks prior to presentation, he had noticed a painful lesion in his left antecubital fossa (figure 1), which had gradually increased in size. Ten days later, he developed malaise, diffuse joint aches and a new rash (figure 2) over his torso, arms and legs. He had no palpitations, joint swelling or neurologic changes. 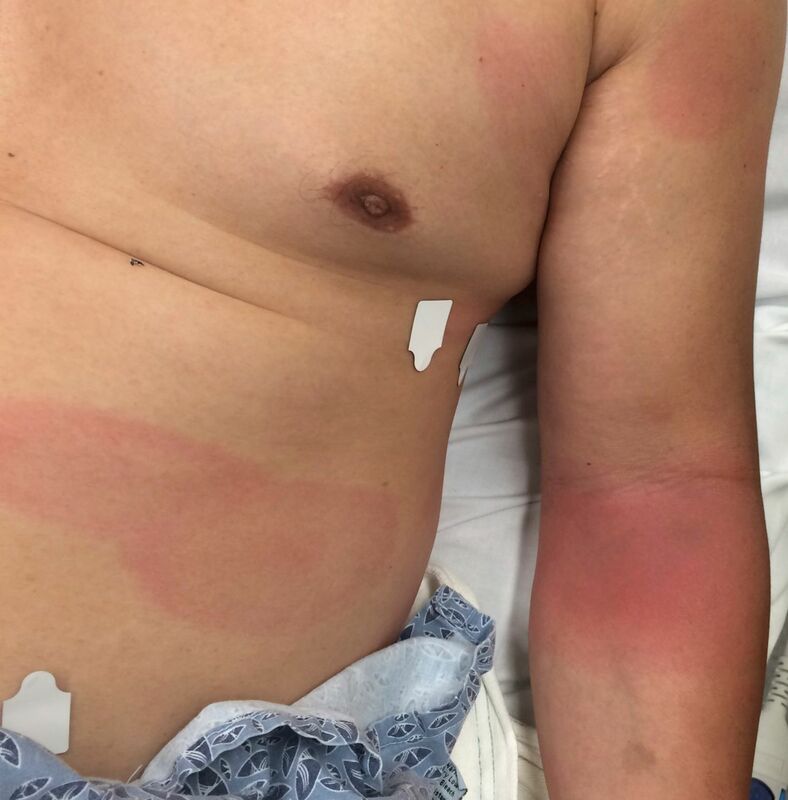 Prior to the onset of his symptoms, he had vacationed in Wisconsin in early June—a Lyme-endemic region of the USA—and suspected that he may have had a tick bite to his left arm in the region adjacent to his initial rash. Physical exam was remarkable for a painful, indurated, erythematous plaque in the left antecubital fossa and multiple painless, erythematous patches with central clearing across his torso. He was afebrile, had no joint swelling or erythema and had no focal neurologic deficits. An ECG was normal, with no atrioventricular block, and a complete blood count and chemistry panel were unremarkable. The patient was clinically diagnosed with early disseminated Lyme disease and started on oral doxycycline for 3 weeks. Lyme serology studies drawn in the emergency department later returned with elevated IgM antibodies, supporting the diagnosis. On completion of treatment, the patient had complete resolution of his symptoms. The initial erythema migrans lesion (right), manifest as a homogeneous, erythematous plaque in the left antecubital fossa, as well as an erythematous patch on his abdominal wall demonstrating the less commonly seen ‘bull’s-eye’ appearance of early disseminated Lyme disease. Multiple erythema migrans lesions on the patient’s back corresponding to haematogenous spread in early disseminated Lyme disease, manifest as circular, homogeneous, erythematous patches. Erythema migrans (EM) is the hallmark lesion of early Lyme disease, classically described as a bull’s-eye pattern though more commonly manifest as a homogeneous patch. Multiple forms of EM are possible in early disseminated Lyme disease. Practitioners should have a high suspicion for neurologic and cardiac complications in early disseminated Lyme disease. Oral doxycycline is the antibiotic of choice for outpatient management of early disseminated Lyme disease, while late disseminated Lyme disease requires parenteral antibiotics. Contributors PDB was involved in the care of the patient described in the case, wrote the manuscript, contributed to the editorial process and provided the photographs submitted. JSI was also involved in the clinical care of the patient, contributed significantly to edits and alterations to the manuscript and provided editorial guidance. Both PDB and JSI have approved of the manuscript submitted.